Optional: Taking a hike to the Dian Fossey grave site, tour to the twin lakes of Burera & Ruhondo, Cave tours in Musanze, bird watching and community ecotourism in Iby’Iwacu cultural village Accommodation at peak spot Lodge (BB). Day 5: Gorilla Trek in Bwindi Impenetrable Forest: Bwindi – Gorilla tracking: Have an early morning breakfast and then report to the park headquarters for briefing about the dos and the don’ts during your Gorilla Tracking. With a ranger guide, you will trek for 1-8 hours through thick creepers and undergrowth with your guides to find the Gorillas, tracking starts from the point where the gorilla were the previous day. The steeply forested landscape is incredibly dense but crisscrossed by numerous animal trails allowing you access. It is an extraordinary feeling being with these beautiful yet endangered creatures. 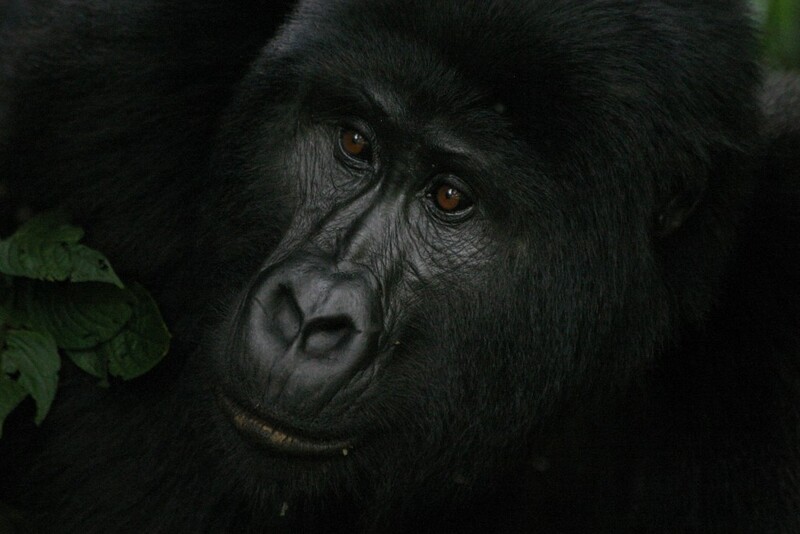 After spending up to one hour with the gorillas, return for Dinner and overnight as previous night. Day 8: Bigodi Primate Walk and Transfer to Entebbe for late flight at 11:30 PM: This morning with a local guide, you will participate in the Bigodi swamp walk looking for some of the 200 bird species, primates and other wildlife found here in a community sanctuary. After the swamp walk, continue to fort portal for lunch at garden restaurant. Fort portal town, is the most favorite town by travelers in Uganda and also home to the palace of the King of Toro located bellow the Rwenzori Mountain ranges. The journey to Entebbe will take you through the small homesteads, forested farms and towns like Mubende, Mityana until you reach Kampala then connect for one hour to Entebbe for the flight End of services (BB). The prices are based on guests sharing room. Single supplement fee will be charged if guests choose to use separate rooms. We can put the entire trip on full board and supply a new price, upon request.